I read somewhere that the type of shell options a crab is given may change the way its abdomen curls and which side its big claw is on. Is this harmful for the crabs at all? Who experimented and found this out, if it's even true? It is, as hermits have been found wearing sinistral shells in the wild. Sinistral means the shell is reversed from normal, opening on the left instead of the right. 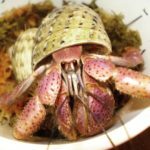 A normal crab is built to fit right opening shells since it's large claw blocks the opening. A crab that wears a shell in reverse needs a big claw on the opposite side. It's also been noted that crabs wearing garbage that causes straight abodmens will also have a straight abdomen when naked. It affects the way they hold their tail.